In case you missed it, earlier today Arizona Senator Jeff Flake took to the Senate floor and compared President Trump to Joseph Stalin. Flake did the same in an op-ed earlier this week and now, the White House is responding. "I found it quite interesting that he [Jeff Flake] is coming out to attack the President considering he's the one that was recently defending an actually oppressive regime. He went to Cuba a few weeks ago and served as a mouthpiece for the oppressive Cuban government," White House Press Secretary Sarah Sanders said during the daily briefing Wednesday. "He's not criticizing the President because he's against oppression. He's criticizing the President because he has terrible poll numbers." Flake visited Cuba late last year and argued he saw no evidence U.S. diplomats in Havana were attacked by the communist Castro government. Diplomats suffered brain trauma and severe hearing loss while stations at the embassy. He also backed President Obama's "normalization" of relations with Cuba in 2014, despite the regime's ongoing and egregious human rights abuses. 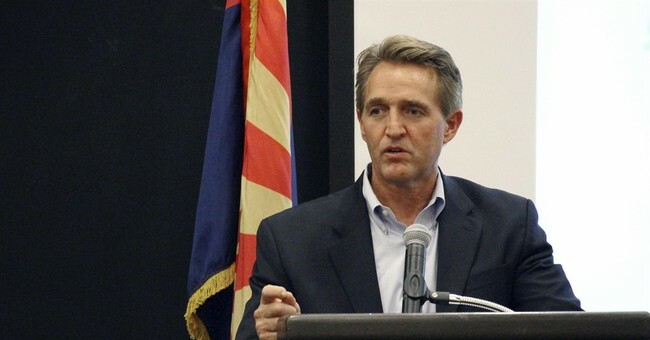 Flake purposely made his floor speech today ahead of Trump releasing his "fake news" awards this evening.